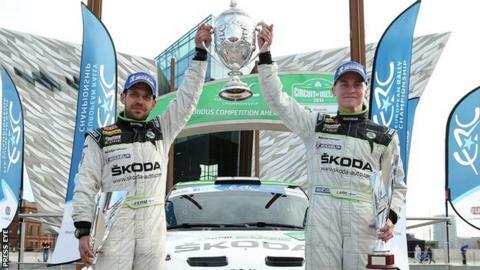 Finland's Esapekka Lappi and co-driver Janne Ferm won the Circuit of Ireland Rally which finished on Saturday. It was a Skoda Fabia one-two as Sepp Wiegand came in one minute, 50 seconds, behind the winner to take second place. Lappi had led from the start and sealed his triumph in the final Gregorlough stage between Dromore and Lurgan. Dubliner Robert Barrable took third place while, in the Irish National Championship, Declan Boyle grabbed victory after Gary Jennings crashed. Jennings looked to be heading for victory but his crash on the final stage handed the win to Boyle in a Subaru. Boyle's fellow Donegal man Donagh Kelly was second in the national rally with Glengormley's Derek McGarrity in third. Five-times Circuit winner McGarrity's result increased his lead in the Northern Ireland standings. The Circuit of Ireland was back on the calendar after a one-year absence and is round four of the European Rally championship. Thirty-seven crews entered for the International section, with 84 crews forming the National entry list. A total of 14 nations were represented.